If you want to experience information overload, just Google “cleaning cast iron cookware.” You will find so many conflicting ideas and theories you might just say “Forget it!” and give up. 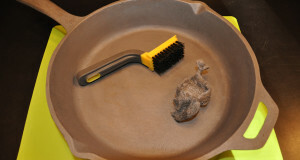 But to clean, care for cast iron cookware, really isn’t that difficult. So 50 Campfires did the research. 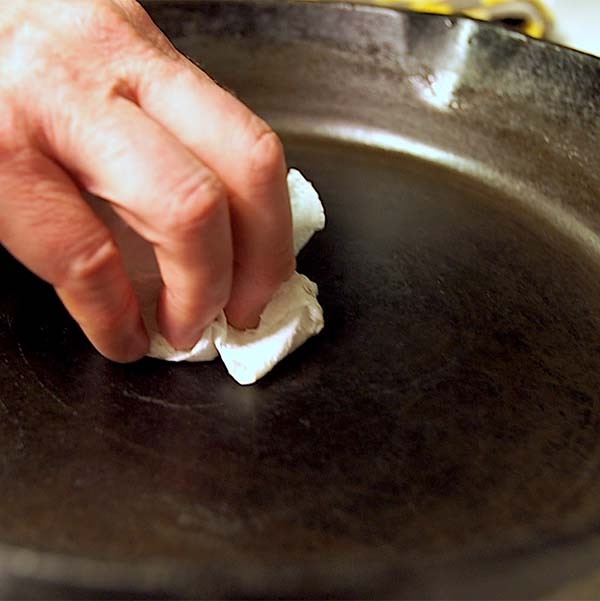 We gathered the facts and compiled the simplest, most straight forward method to clean and maintain your cast iron. FACT: Today, nearly all new cast iron skillets come from the factory PRE-seasoned and ready to cook. All you need to do is rinse it in warm water, dry it with a towel … and GO! 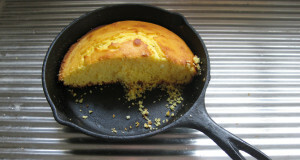 If this new skillet or Dutch oven is your first, spend a few extra bucks and buy a couple items to go with it. They even come in a convenient kit if you want. 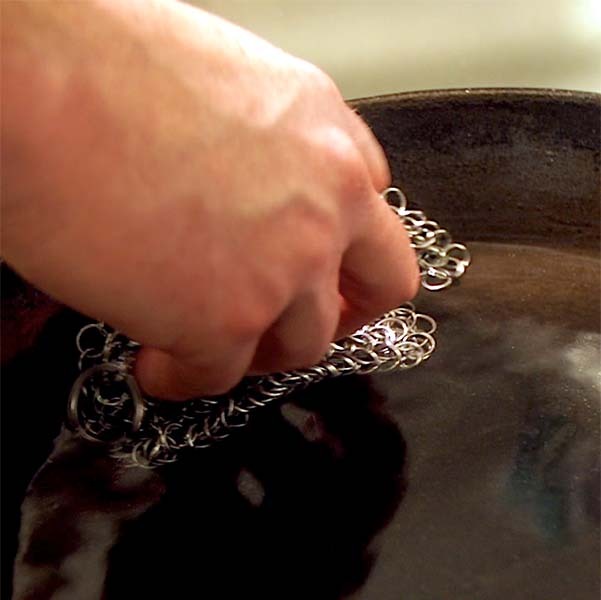 You need a brush, a scraper, and – our favorite – a chain mail scrubber. 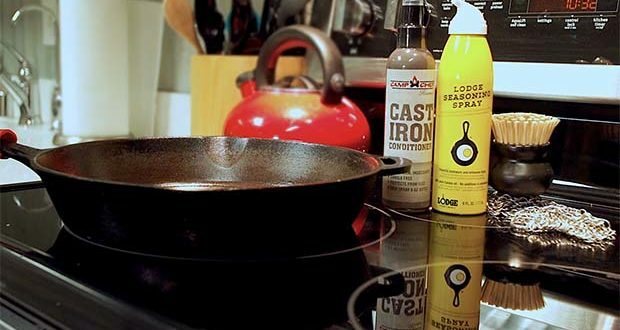 These – and water – are all you’ll ever need to clean your cast iron if you do it the right way. #1 After the pan has cooled so you can comfortably handle it, remove all the cooked food you possibly can with a spatula, spoon, or pan scraper. 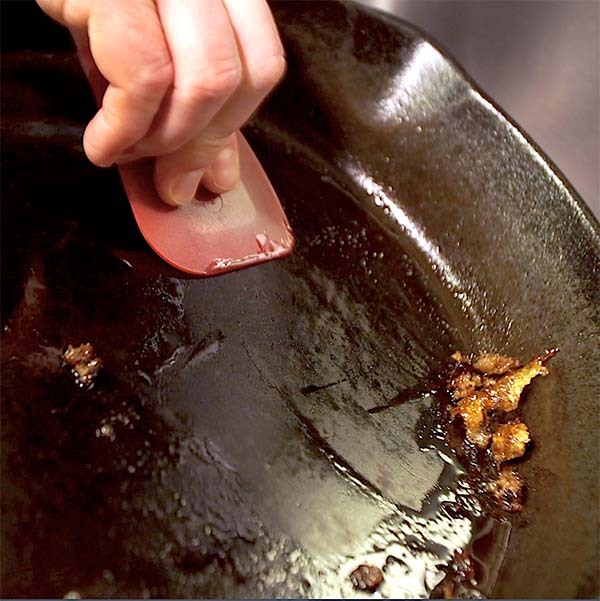 Scrape away – you’re not going to hurt the cast iron. #2 Fill the pan with enough hot water so it comes up as high on the sides as the food did while you were cooking. Place on the heat and warm it up. 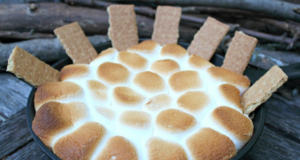 #3 Use your bristle brush to remove anything that’s baked on. #4 If there’s some really stuck on gunk, break out the chain mail scrubber. It will remove anything you want removed … and nothing that shouldn’t be. 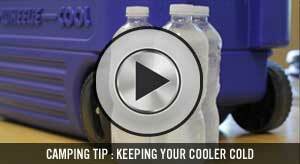 #5 Dump out the water. Wipe dry with paper towel, and return to the heat. #6 Once it’s completely dry and a little bit warm, drizzle a bit of vegetable based cooking oil (sorry, NOT bacon fat at this point) or spray with a conditioning spray. #7 Wipe away dry as much oil as you can with a paper towel, then wipe inside and out with that same paper towel. No – we didn’t use soap! 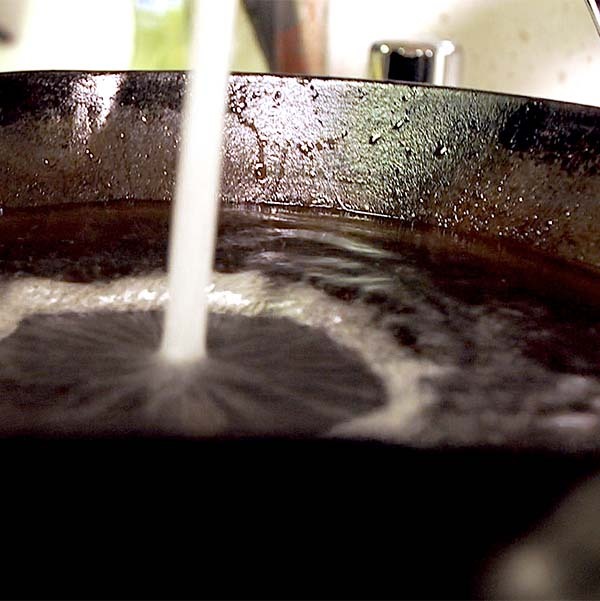 Both Lodge and Camp Chef, the two companies who dominate the cast iron market today, agree it’s fine to wash cast iron quickly with a little dish soap, as long as you rinse and dry thoroughly and apply the oil between uses. 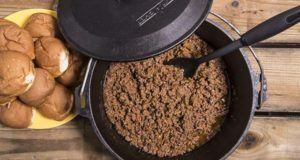 If it will be awhile between uses and you might be storing your Dutch oven with your camping gear, a zippered case is a nice way to protect it. The MOST IMPORTANT THING is NOT letting your cast iron sit with food or water in it. 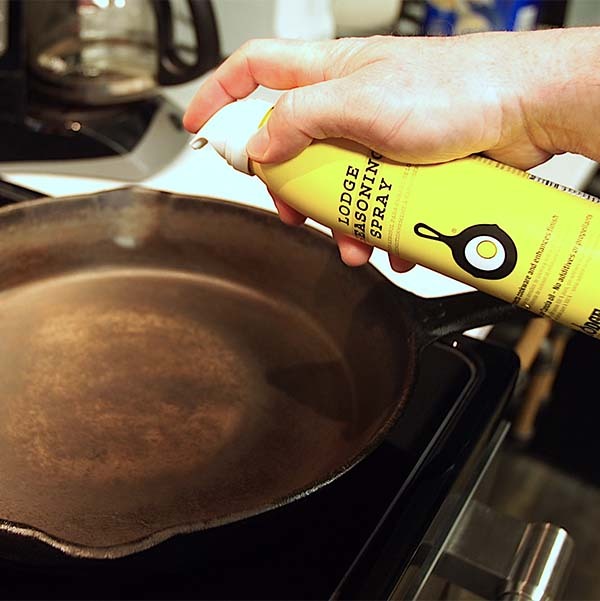 Clean it up as soon as the meal is over, and you’ll never have a problem and never lose the non-stick seasoned finish from your cast iron. 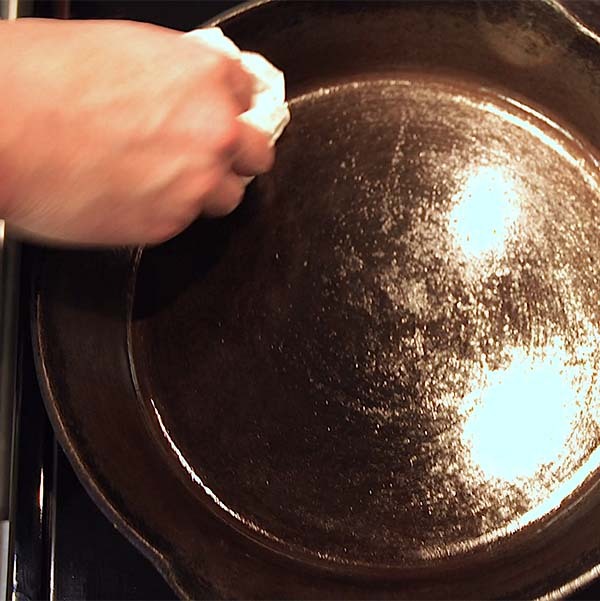 Want to see how to clean, care for cast iron cookware step-by-step in video form? 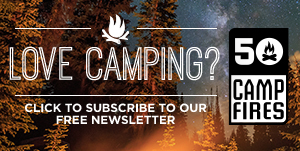 Check out 50 Campfires video on Bass Pro Shops 1Source.